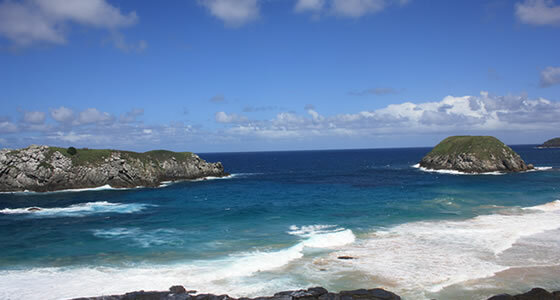 When to go to Fernando de Noronha. Asking yourself what's the best time to visit Fernando de Noronha? Get all the answers, tips and advice from our team of local experts. It is important to visit the right place at the right time to get the best of what the place offers. The best time to visit and enjoy your vacation on the island is from December to February, perfect especially for surfers and not so pleasant for swimmers. However, this doesn’t stop you from exploring the island. Only about 420 tourists are allowed at a time, so it is best for you to plan your schedule well in advance. Hiking is best done when the season is dry with clear trails and lush green vegetation. The trail becomes muddy and difficult to walk during the rainy season. Keep a check on the weather the previous evening to ensure there’s a dry morning coming up. For scuba diving, Atalaia beach is the best place. The best time to go scuba diving in this place is when the tide is low, that is when the sea is calm and visibility good. Access to this beach for scuba diving is controlled, so you need to have the permission from the national park head quarters. Only 30 divers per day are allowed and using any kind of sun block is strictly prohibited. The water here is home to octopus, a variety of colorful fishes and a number of different species of fishes. The Mar do Dentro coast also offers good conditions for diving. The best time to visit this place is early in the morning. 6 am is good enough or if you make it earlier there’s nothing like it. Access to this place is very difficult but hiking the 60m long cliff is rewarding. At the first glimpse of light, the bay transforms into a sporting arena with enthusiastic spinner dolphins displaying their most sensational acrobatic skills. It’s a sight you cannot afford to miss. This bay is a mating and resting place for rotator dolphins. It’s worth going on this beach twice, because depending on the tidal movements the shore is alternately covered with sand and pebbles. This is a bustling place, where you can shop for some local handicrafts. The presence of the “Dog Bar” on this island makes the night come alive. There also is the Santana ruins, a fortress which is open to visitors.